MOCpages was the first place I started uploading my mocs years ago. I'm glad that it's still around. Until my build schedule calms down and I can update MOCpages, find my full portfolio on Flickr at imaginebrickzone . Things are updated over there a bit more. 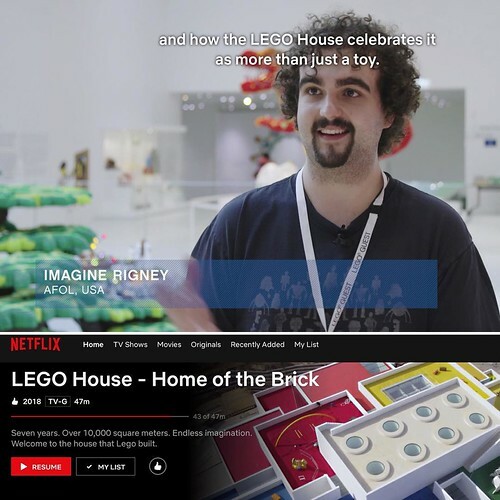 This is something cool which happened in 2017 at The LEGO House in Denmark. I was setting up my mocs in the Masterpiece Gallery when they interviewed me. Didn't know it would be in the film. Misc. MOCs - ships, vehicles etc. Imagine Rigney has joined the group "(Beta Version) Eroberung: A Dieselpunk World ". Imagine Rigney is one of Guy Pearson's favorite builders! Imagine Rigney is one of Ahsoka gipson's favorite builders! Imagine Rigney is one of Sky Raider's favorite builders! Imagine Rigney is one of HawkNinja . 's favorite builders! Imagine Rigney is one of Rove Random's favorite builders! Imagine Rigney is one of Ty (Jesusloverocks)'s favorite builders!